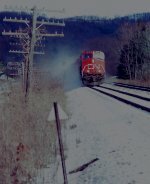 Description: NS 41T appraoches the location of the center siding east of Waverly, where during Erie and EL days there was a siding between the two main tracks. Description: CSX freight arriving Montgomery from Pensacola. They will be passing the beautifully restored Union Station in a few minutes. Description: CN's Dubuque switcher works the south (west) end of the yard on a clear November morning with downtown Dubuque in the background. Description: Hood doors open, leaving 16 cylinders some air to breath, cool air at that. For summer, 68 degrees is rather cold. Description: These are for sell and the ones that dont get sold are to be scrap. Description: Two EMD locomotives head light through Lemont.